As many of you know, we LOVE Mexican and Southwestern food in our household and eat it frequently. However, I tend to make the same few dishes over and over again to serve with it (Cilantro-Lime Rice, Mexican Rice, and black beans). They’re super delicious, BUT I’ve been wanting to change things up. So, I took to my Facebook page earlier this spring, and asked for ideas. And WOW, you all came up with some wonderful ones — from calabacitas to elote to papas y mas. (Click here to read all of them). 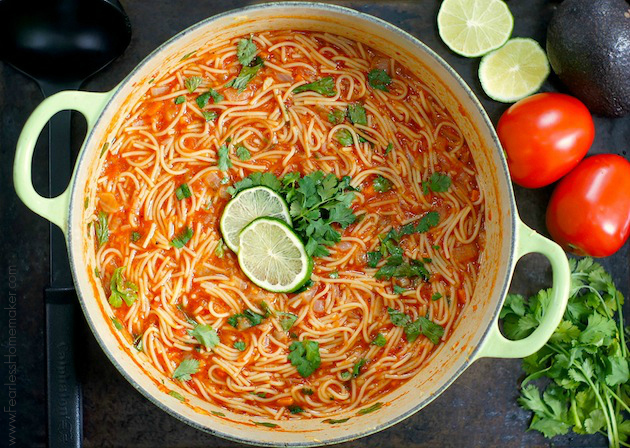 One suggestion in particular called out to me immediately: Sopa de Fideo, which is essentially a Mexican tomato noodle soup. So, I did some research on it, looked through a ton of recipes, and made a version for my family and I to try. And wow, this soup was incredible! This is total comfort food for me, as it combines some of my favorite things: soup, pasta, and citrus. The broth is slightly thick, due to the starch released from the pasta, which gives it a rich, hearty consistency without needing butter or cream. The pasta is tender + wonderfully flavorful from toasting it in oil. 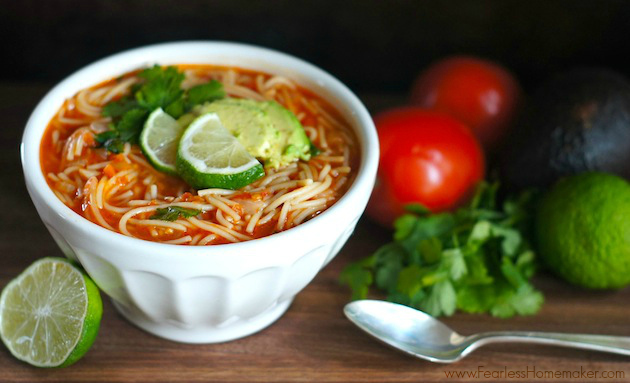 And the tomato-lime-cilantro flavors of the soup are bright, tangy, and wonderfully balanced. I can’t believe it took me 30+ years to try Sopa de Fideo, and I’m going to make up for lost time by eating it constantly from now on. =) Thank you to reader Norma for suggesting this amazing soup, and to all the other commenters for your fabulous ideas — I’m working my way through your suggestions, one by one! Heat the oil in a large soup pot over medium heat. Add the uncooked broken vermicelli noodles and cook for 3-5 minutes, stirring frequently, until the noodles are golden brown. Add the onion, garlic, cumin, salt, and pepper to the pot with the noodles, and cook for 5-7 minutes more, until the onions are softened and translucent. Add the crushed tomatoes, chicken broth, and jalapeno (if using). Bring the mixture to a boil, then reduce the heat and simmer, for 10-15 minutes, until the pasta is soft. Remove from the heat, add in the chopped cilantro, and juice of 1/2 the lime. If you want a more lime-y soup, add in the juice from the remaining 1/2 lime. Stir well to combine, and add more salt/pepper, if needed, to taste. Serve immediately, garnished with additional cilantro, lime, and chopped avocado, if desired. This looks fantastic – pinning to try (hopefully) soon! This looks delicious! And hey, it also seems easy. I like both of those things! We are big fans of Mexican food and I love finding new recipes to try! This dish looks incredible, Amy! I’ve never tried it before but I am a fan of all the ingredients in here! The flavors sound amazing and look so comforting! Can’t wait to make this! whoa, totally tricked me out. the photo looks a bit like a big bowl of spaghetti with a lime on it. this sounds wonderful! YUM!! This looks amazing! I seriously LOVE soup and could eat it all year long!! YUM! Great recipe!! One of my favorite soups! Love your photos! For me, one of the best parts of blogging is the experience of trying recipes that I never would have found otherwise. Sounds like this soup was a real winner for you! This really does look so good, I will be trying this out! I just made it! Super easy and it was amazing!!! Wonderful, Norma! I am so thrilled you loved it! This is a perfect recipe. When I left Texas to come to Indiana I lost this. Now It’s back. Thank you. And my family thanks you. I make this at least twice a month, but mine is soup like. I also add chorizo to mine. I grind, cumin seeds, garlic cloves, and peppercorns. V-8 juice is also a wonderful to addition to this. Sounds awesome, Kathy – thanks for sharing your changes and adaptations! Is the jalapeno to be removed before serving? Instead of using canned tomatoes use a cup of homemade salsa along with a small can of tomato sauce, I spread the fideo on parchment paper ,spray with olive oil or spray canola oil on it and toast it in oven for 5- 7 minutes. Watch carefully so it does not burn. Then finish according to the rest of the recipe. matter, it might not be a taboo subject but usually people don’t talk about these subjects. a web site, which is useful designed for my experience.